Safety first: In Massachusetts, a recent Law requires that when you replace your battery smoke detectors, the replacement detector must have a 10-year battery. Please don’t assume the battery will last 10 years; for your safety, test the detectors regularly. It’s probably a good idea to keep the the receipt so that if the detector doesn’t work for 10 years, you might be able to get it replaced for free. Another reason to keep the receipt is for a record of its installation, especially if you might sell your home. That thought then then brings up the question: When you buy a property, how much time has lapsed since the installation of the “10-year” detector in your new home? Test your detectors regularly! Be aware that detectors have a shelf life, even hard-wired detectors. If you have a hard-wired system for smoke, security, etc., have the metal box containing the mechanicals checked regularly to be sure the fuses are working. Just because your electricity is on doesn’t mean that your system is in working order. Photoelectric detectors were developed for installation within 20 feet of a kitchen or bathroom. These detectors are not as sensitive to steam from showers and cooking smoke; the detectors were created to keep residents from dismantling nuisance detectors and having no alarm at all. Buy king-size pillows for your single, double, queen-sized beds–much more comfortable and luxurious than regular-sized. Have a good end of summer! An almond a day can help to deter Alzheimer’s; kiwis can help lull you to sleep; canned pink or red salmon has more omega-3’s than fresh. The 4 photos below show how destructive English ivy can be. 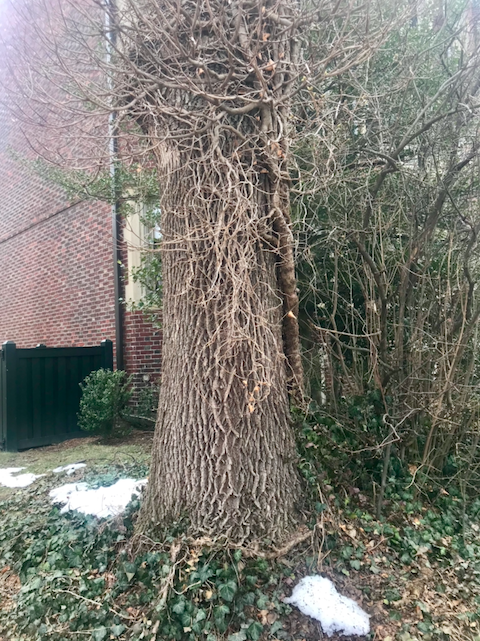 English ivy is an invasive plant which strangles the tree; starves it of water; and within a couple or few years, depending on the size of the tree, kills it. 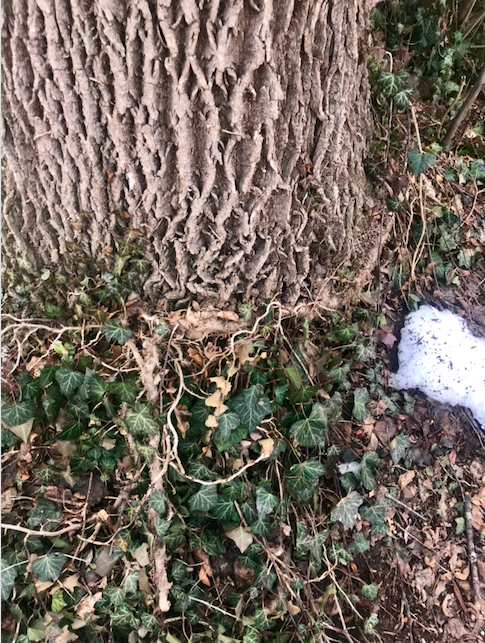 The owners of this tree removed a good portion of the ivy which had encircled the tree but still need to saw one very large line of the ivy. 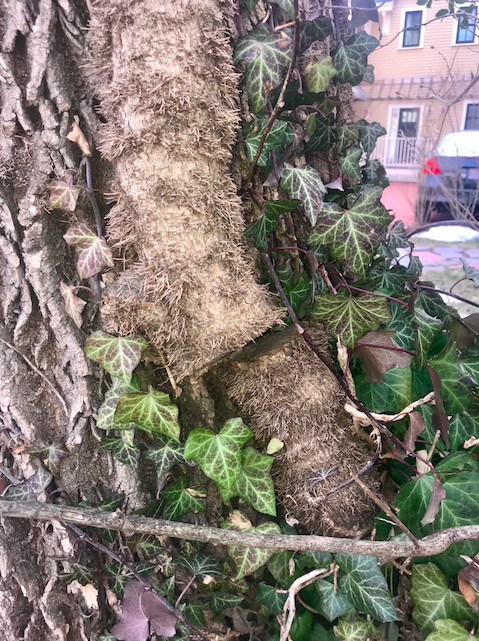 The ivy clings to the bark with centipede like pincers, insinuating itself into the grooves of the tree, making thick lines impossible to pull off without seriously damaging the bark. The leaf of the English ivy is distinctive; there is a lot to read on the web. If your tree or the tree of a friend or neighbor is affected, do let them know. 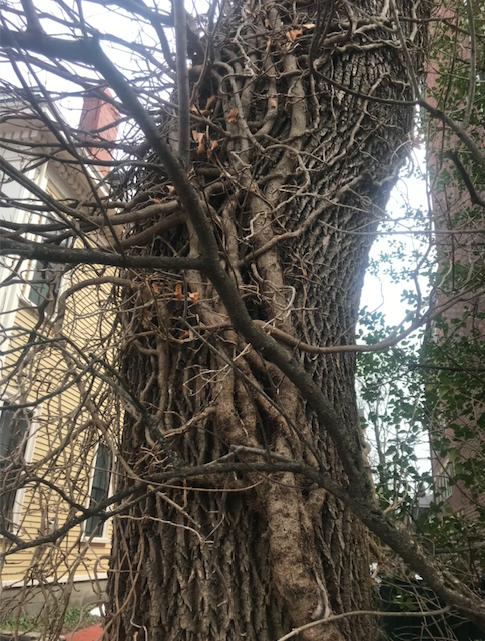 For some obscure reason, Harvard still plants the ivy and their trees along Garden and Linnaean are ivy-covered. Trees are beautiful; provide us with shade and comfort; add value to properties; and their leaves absorb pollution. Wash or clean the inside of your reusable bags monthly and keep them in the cleanest part of your car. Wipe the cart handle with the disinfectant item the store provides or bring your own. The Journal of Food Protection Trends found E. coli on 50% of shopping cart handles (astounding!). Check your eggs. Open the carton to be sure they’re all intact. If an egg breaks on the way home, cook it within 24 hours. Bag meat of any kind separately and, at home, keep it in the same separate bag until ready to use. Organize your cart; keep meat/poultry separated from other foods around it. After you have handled meat, disinfect your hands before shopping for other items. Keep frozen foods together to help to keep them cold longer. Get your food home in 2 hours; 1 hour in hot weather. Life is getting less complicated with the year winding down and the transition to Compass less hectic, so I’m back to my monthly home tips. We’ll be settled in our new and beautiful office on the east end of Harvard Square, at the corner of Mass. Ave. and Trowbridge, this week. I hope you find the tips helpful; I have the names of local contractors if you need them. Please visit me at our new office. Debate continues on the deleterious effects of cell phone use. Users are advised against storing your phone in the pockets of your clothing. This link is worth reading, especially if you travel a lot for business. Have your chimney cleaned and checked for creosote buildup.